I believe I may have mentioned that I love soup. I’m never happier than when I’ve a pot simmering on the stove. My beloved however regards soup as an appetiser, not a meal in itself. There are times when I’ll make a base, say pea soup, and then add ham, bacon or sausages to his portion to make it more filling. However, when he’s away I’ll frequently cook up a batch with whatever I have in the vegetable box and enjoy it over a couple of days. This is not so much a recipe, more my soup philosophy. If I’m making soup as a starter for dinner with friends, I might use a recipe. Alternatively, if I see a tempting recipe for a soup I’ve never made before, I may well (initially) follow the recipe before making it my own. And really, that’s the rub. You should make soup you love eating/drinking. Something that, particularly in winter, brings you warmth and joy. The above were the contents of my vegetable box. I could have made a vegetable curry but these just screamed spicy root vegetable soup. I’m a big fan of curried parsnip soup but here they just lent some sweetness to the soup while the lone turnip added a peppery touch. The flavour of carrot dominated. Carrots go particularly well with coriander but I didn’t have any of the fresh herb in the fridge. I did however have hot chillies, fresh ginger and fresh garlic which I fried in a tablespoon of coconut oil with the finely chopped onion. I’m not really supposed to eat anything fried, but I won’t tell if you don’t! To be honest, boiled onion is an unappetising addition to any soup. You’ll note that I’ve merely roughly chopped the vegetables. This is because I intended liquidising the soup so I could drink it from a mug while I ploughed through my pile of outstanding work. 1. Heat the oil in a deep-sided pan over a medium flame, then fry the onion for five minutes, stirring occasionally, until soft and translucent. Add the garlic, ginger and chilli, stir-fry for a couple of minutes. 2. Now add the carrots and parsnips, and cook for a couple of minutes, stirring occasionally. 3. 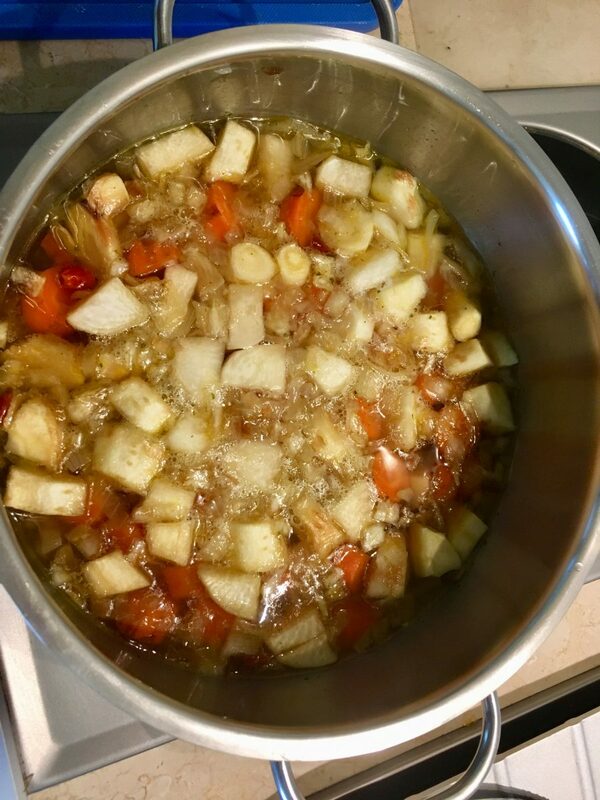 Add the stock, bring the mixture up to the boil, then turn down the heat to gentle simmer until the vegetables are tender. 4. 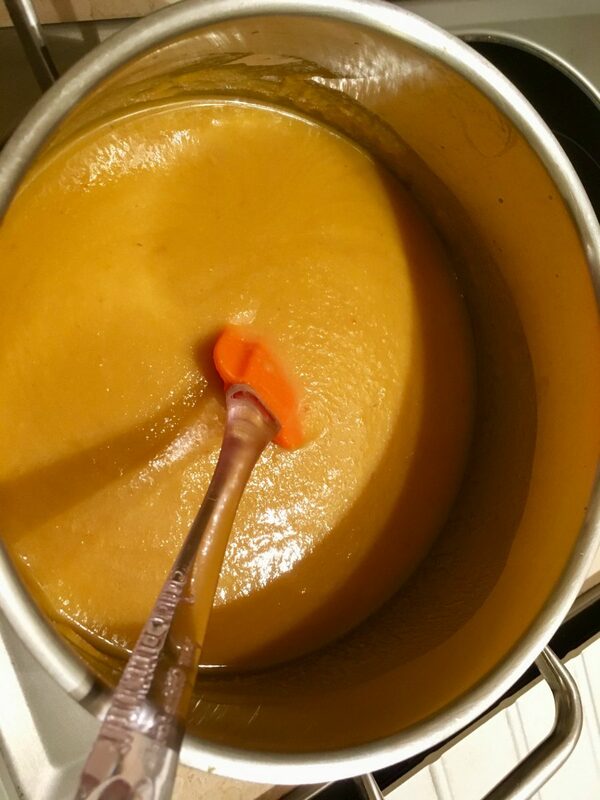 Now blend the soup either with an immersion stick or free-standing liquidiser. If you want a finer texture, you can now sieve the soup. 5. Return the blended soup to the pan, if necessary, adding more water to obtain the desired consistency. Check seasoning and re-heat. 6. To serve, ladle into bowls or pour into mugs. This is where a swirl of coconut cream wouldn’t go amiss! 1. If you don’t like your soup too spicy, either omit the chilli entirely or omit the seeds from the chilli. 2. 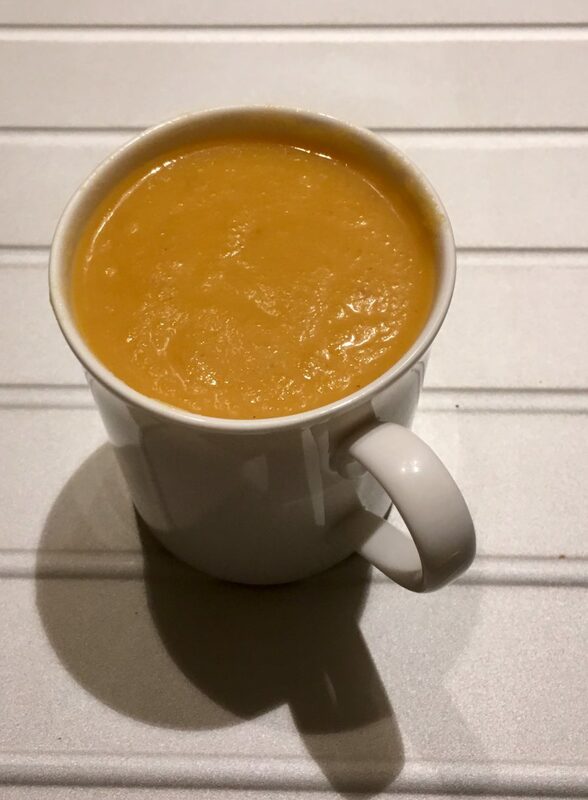 If you’d like a heartier soup, make it more like a mulligatawny one, with the addition of 1 tsp ground cumin, 1 1/2 tsp group coriander and 150g (1 1/2 cups) red lentils, washed and drained at stage 2. In which case, make sure your vegetables are in small dice, and don’t liquidise the soups. 3. If you’re cooking for friends, add some parsnip chips. Preheat oven to 180C (160C fan)/350F (325F fan)/gas mark. Peel another parsnip then, using a vegetable peeler, shave the flesh in long thin strips. Lay these on an oven tray and coat (use your clean hands) with 1 1/2 tbsp. of olive oil and bake for 12 -15 minutes until crisp and golden. To serve, top each portion with a handful of the crisps. 4. You can use this basic soup recipe with a variety of vegetables and pulses. Just make sure, the flavours are complimentary. For example, this method would work well with sweet potatoes and carrot, or butternut squash. 5. Roasting the vegetables in the oven beforehand is also a great idea to enhance the flavour of the finished soup but you can equally use left-over cooked vegetables. Experiment but, above all, have some fun! Perfect Soup for this weather! 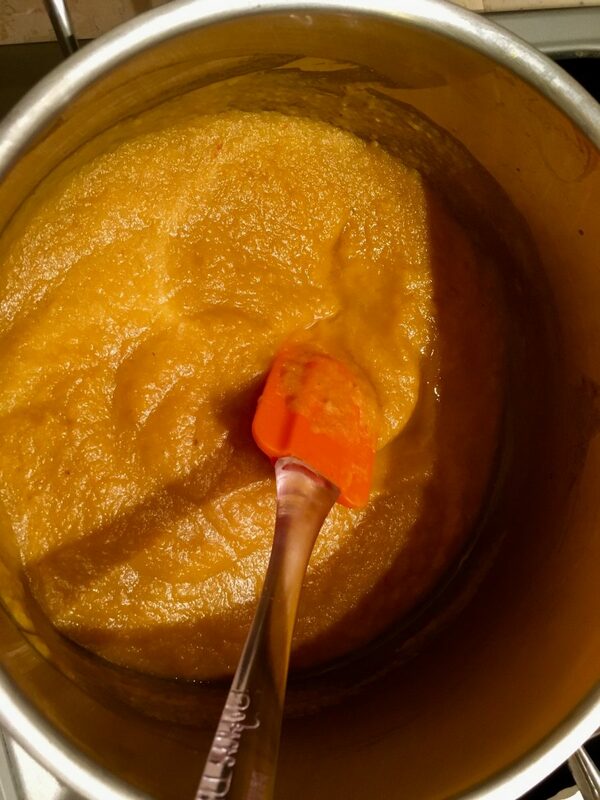 I love me a good, wholesome batch of pureed soup too, Sheree (I really think our partners might be soulmates separated by the waters – mine refuses to be content with just the soup as a meal by itself. Grr! ).